Maryland's popular Republican governor is earning enough support from Democrats and black voters in the state's largest jurisdictions to narrow the pathway to an upset sought by Democratic challenger Ben Jealous. FORT WASHINGTON, Md. (AP) — Maryland’s popular Republican governor is earning enough support from Democrats and black voters in the state’s largest jurisdictions to narrow the pathway to an upset sought by a challenger who led the nation’s oldest civil rights organization. Democratic challenger Ben Jealous, a former national president of the NAACP, needs big support from Democratic strongholds in the suburbs of the nation’s capital and Baltimore to become Maryland’s first black governor. But Republican Gov. Larry Hogan is getting votes from black voters as well as white Democrats crossing party lines and splitting their tickets, according to pre-election polling and interviews with voters. A win for Hogan would make him the first Republican governor re-elected in Maryland since 1954 — and only the second in the state’s history. “I really wanted to vote for Ben Jealous, because I am a Democrat, but he just didn’t show me that he had enough experience,” said Karen Johnson, a 48-year-old federal government employee who is black, adding that she decided to “stay with what is working,” after she voted early in Prince George’s County, one of the nation’s most affluent black-majority counties. As Democrats hope for a “blue wave” nationwide, early voting turnout has been higher so far in Maryland — where Democrats outnumber Republicans 2-1 — than it was in the 2014 gubernatorial race. The Jealous campaign believes higher turnout will add up to victory in a state where President Donald Trump is unpopular, even if Hogan has the advantages of incumbency and a fundraising edge. Kevin Harris, a senior adviser to the Jealous campaign, said Friday that voters are still learning about Jealous, and he’s confident Democrats will support him on Election Day. “There’s still a lot of voters who still don’t know Ben and are making up their minds about him,” Harris said. But it’s not unusual to find early voters who say they made an exception for Hogan on an otherwise straight Democratic ballot. Mileah Kromer, director of the Sarah T. Hughes field Politics Center at Goucher College, said a “blue wave” may have trouble materializing in Maryland, where Democrats already control the state’s U.S. House seats 7-1. Hogan has also put a lot of distance between himself and Trump. “There’s just not a lot of places for the blue wave to go in Maryland,” Kromer said. In Baltimore, which is about 64 percent black and heavily Democratic, Ursula Guthrie said she didn’t feel like she knew Jealous, despite his leadership of the Baltimore-based NAACP from 2008 to 2013. “I don’t really know who Jealous is as a person in the same way that I know who Hogan is,” said Guthrie, an early voter who was supporting a Republican for the first time. A Washington Post-University of Maryland poll released last month found Hogan’s support from black voters has more than doubled since his 2014 campaign, from 14 percent to 33 percent, while Jealous received support of 57 percent of black voters. A Washington Post poll last month found Hogan with an overall double-digit lead over Jealous. Much of Maryland’s rural areas are Republican. That makes success for Democrats in statewide races largely dependent on support in the state’s heavily populated and Democratic areas, including Baltimore and Prince George’s and Montgomery counties. 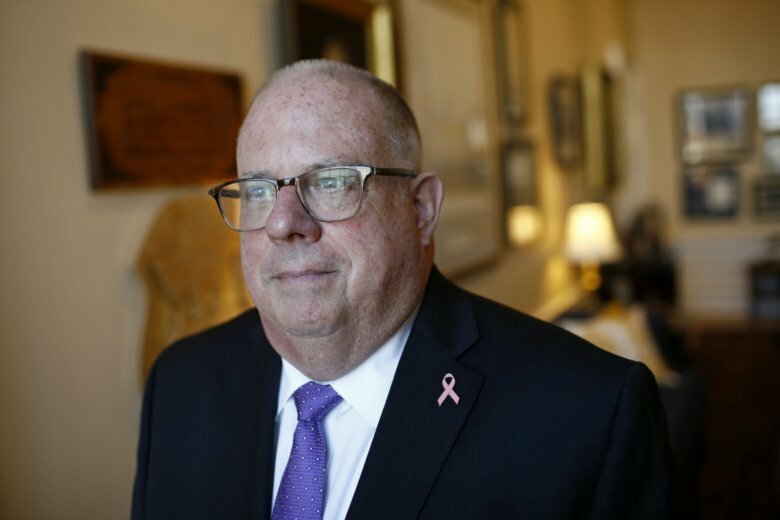 In Montgomery County, the state’s most populous jurisdiction with more than 1 million residents, several Democratic voters interviewed recently said they were picking Hogan. Jean Harris, who was one of them, said she didn’t know much about Jealous. “When you find someone who is doing and fulfilling the needs of the people — because that is what the job is about — you have a tendency to stay with that, rather than to venture off into someone new that you don’t have much status and information about,” said Harris, who’s 80. Still, the Jealous platform resonated with Gregory Miller, a 69-year-old Bethesda resident. He cited Jealous’ emphasis on education and proposal for Medicare for all. “I like the governor now, but I just think some things need to be changed — that he could help the whole state better,” Miller said.